Nothing says class like the classics. The ancients Greeks and Romans were justly famous for their simple, yet elegant art – especially sculpture, many pieces of which still stand today or inhabit museums like the Louvre. While you may not be able to take home a piece of the Pantheon or nab a piece of ancient pottery from Pompeii, you can purchase pieces that will make you feel as though you are in an ancient pavilion. Who knows? When your friends see them and decide to get some of their own, you may start a new wave of neo-classicism. 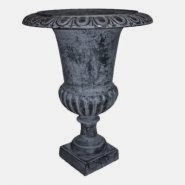 Look for antique cast iron urns and actual marble to ensure that your pieces last for many years to come. There has always been something exotic about eastern Asia, ever since Europe first began to trade with the area for silk and other goods. Perhaps it was their distance or their unfamiliar way of life that made the people so mysterious, but there is no denying the beauty and timelessness of their art. If you are an enthusiast of eastern styles and want to show it, then there are certain staples that you must have. For one thing, no Asian-themed room is complete without some kind of intricate pottery, but almost everyone has this kind of vase so you'll want to get a little more creative. Cranes, while not exclusively East Asian, are a theme in several stories and a subject of a lot of artwork, and anything with a bamboo pattern is always a good choice. The '20s were a unique time period in terms of both culture and style. With a World War behind them and women's lib at the forefront, people were incorporating many modern concepts into art, while still retaining a fascination with the ancients. The emphasis on modernity can be best seen in Art Deco, a style which celebrated new technology and labor with cool metallics and geometric shapes. On the other hand, with a flurry of discoveries in the Valley of the Kings in the 1920s – King Tut's Tomb being the most famous – Egyptian-themed art had its last pinnacle. Whether you are planning the ultimate Gatsby party or merely love the streamlined look of the era, finding items such as those pictured below will give your home the appearance of an opulent '20s mansion. Remember, if you have a creative mind and know how to artfully combine different styles, there's nothing wrong with doing so; just try to make sure that there's some kind of theme linking the pieces together, be it color or general shape. Another fun option is to choose a theme for each room, so that you can have a little of everything without any conflicting designs. What are your favorite themes for décor? Protect your urn – Cast iron is famed for staying rust-free much longer than other iron objects, and many urns have a protective coat applied over them. However, if your urn is going to be used as a planter, it will be exposed to a lot of water and the elements – meaning it may oxidize over time. Unless you don't mind it changing color and possibly deteriorating, you should get a rust-proofing spray that is meant for cast iron and apply it to the outside and inside of your urn. If your urn has a patina, make sure the spray will not affect it and try a test spot on the bottom first! Pot or no pot? – In general, gardeners tend to put the soil in a pot that fits inside the urn, rather than the urn itself—but this isn't always necessary. If you want to be able to trade out the flowers regularly, or want a lighter urn that is easier to move, then using a pot is a good idea. But if you are making a long-term planter, then filling the whole urn with soil allows the plants to develop more roots and ultimately grow bigger and healthier. Water retention – Iron warms quickly in the sun or even the shade on a hot summer day. This can "bake" the water out of the soil inside the urn, leading to dead plants, even if you're water them daily. To prevent this, use a layer of water-retaining gel crystals underneath the roots of the plant, or even just peat moss. This may be wise even if you are using a pot inside your urn. Drainage holes – Many cast iron urns for sale for gardening use have large drainage holes on the bottom to let out excess water so that the plant isn't oversaturated or start to mold. If your urn doesn't have one of these, you'll need to be very careful about how much water you give the plant or, if it's outside, how much rainfall it gets. Put plants on a covered porch or in a garage during rainstorms outside. Make sure that the soil beneath the plant is kept somewhat moist, but never sopping. When you find cast iron urns for sale, how do you put them to use in your garden or home? A cast iron urn can make a beautiful (not to mention practical) outdoor planter. As any good gardener knows, watering plants regularly is key to their health—but it’s not always the best thing for your cast iron urn. Constant exposure to water and soil, combined with unavoidable elements such as wind, sleet, snow, rain, and humidity, will take a toll on cast iron urns. Over time, the cast iron will begin to rust. Follow these simple steps to get your cast iron urn looking good again. Please note that this process will take you at least two days, including drying time. You will need a hose, steel brush, sandpaper, and a metal file, as well as a cloth, phosphoric acid, and spray paint. Personal safety items such as a mask, eye goggles, and rubber gloves are also highly recommended. Step 2: Clean the urn. With the hose on a high pressure setting, spray the cast iron urn thoroughly to remove any built up grit, debris or dirt. Leave the urn to air dry for several hours or overnight. Step 3: Get rid of the rust. Rust is the main enemy of your cast iron urn. Use a steel-bristled brush to scrape off as much of the rust as you can. For stubborn patches, you can use a metal file (on straight areas of the cast iron urn) or sandpaper (on the rounded corners). We recommend 80-grit sandpaper for this purpose. Step 4: Spray the acid. Spray phosphoric acid on the cast iron urn to dissolve any remaining rust—keeping in mind that the rust may be invisible. Leave the acid to work on the rust for several hours or overnight. Note: when working with phosphoric acid, it is highly recommended that you use tremendous caution. Wear goggles, rubber gloves, and a mask, and do not allow children to play near your work area. Step 5: Scrub the crust. The acid will turn any rust on the cast iron urn into an iron phosphate crust, which you can then scrape off using your steel brush. Using a metal spray paint, paint your cast iron urn. We recommend using a paint that offers some protection from rust. Spraying in a steady back and forth motion, apply three or four light coats of the paint. There you have it! When you have finished these simple steps, your cast iron urn should be looking a lot less worse for the wear. 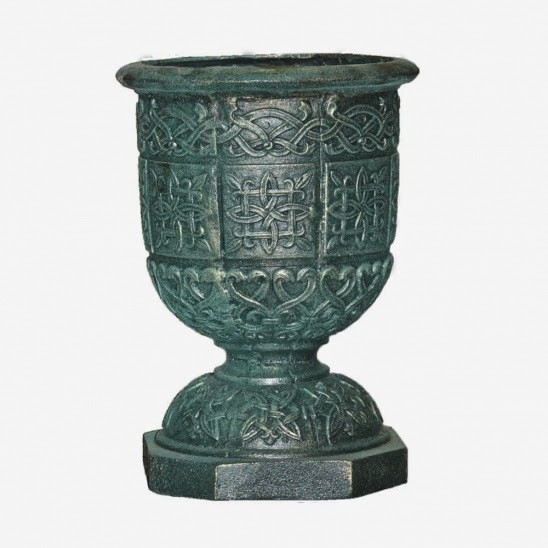 Protecting it from rust and cleaning it regularly will help to guarantee that your urn looks attractive for years to come.